TeaDub Design: Taylored Expressions Blog Hop! Thanks for stopping by and welcome to the blog hop hosted by Taylored Expressions! Our mission was to make a card using any TE stamp set released prior to May 2010. I chose to use "Sewing Cuppie" from the Crafty Cuppie set. I started off attempting to make a card but for some reason the design wasn't coming together as I had envisioned. I'm sure that never happens to anyone else! I decided I would make a sewing notebook for myself since I'm a beginner to that craft. I thought that jotting down all the helpful tips I find on various websites would be a good reference to have in one place. I recently bought a Janome Sew Mini as my first sewing machine. It's so cute and lightweight! It's about the size of a 8 1/2 by 11 sheet of cardstock! 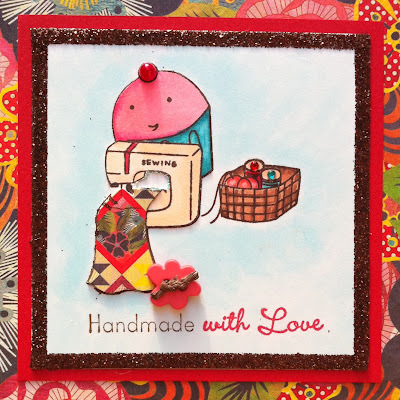 I took a piece of Kraft cardstock and made my own background by alternately stamping the sewing basket image from Crafty Expressions and Tiny Heart from A Muse. Then, I adhered it to an 8 x 10 1/2 notebook and put a strip of Enchanted Evening grosgrain ribbon from Papertrey Ink along the side. 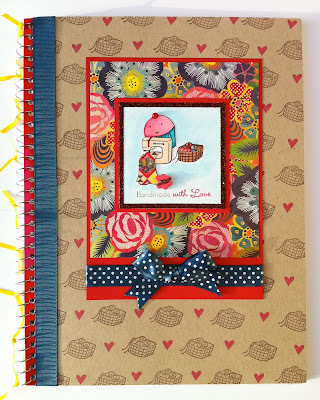 For the centerpiece of the notebook, I used Real Red cardstock from Stampin' Up! for the base and a piece of patterned paper from the Junebug collection by Basic Grey. Love the colors and floral designs! The Enchanted Evening polka dot satin ribbon is by Papertrey Ink. I adhered Sewing Cuppie on Real Red cardstock to give it a double matted look against the patterned paper. I used my Copic markers to color my image and a really light blue green Copic for the background image. There was a sheet of patterned paper from the Junebug collection that looked like a quilt design so I paper-pieced it to the fabric that Cuppie was sewing. To make the sparkly frame, I put strips of 1/8" Scor-Tape from Scor-Pal on all four sides and sprinkled TE Bronze Splendor glitter on the tape. I love how sparkly it turned out! I hope you enjoyed checking out my sewing notebook and have fun seeing all the other fabulous creations! OMG - SO CUTE! Love that little sewing cuppie! I don't know how you stamped that background so perfectly! Amazing. Love the whole project. Thanks for sharing with us. Amazing card. Loved that stamp set. Really cute. This is so cute! 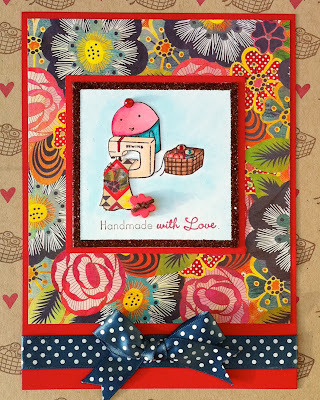 I love how you've colored and pieced the stamping, and the papers give it such a homey feel! Beautiful! LOVE the papers and your coloring!! FAB! This is GORGEOUS, Tina! I love everything about your notebook --- the papers are wonderful and your coloring and paper-piercing are magnificent~! What a great card! I love the paper you used!! I hate when my "visions" don't turn out, lol! This notebook is VERY cute! I love the colors and the ribbon is just perfect! Oh this is sew cute!! I love the piecing and the papers you used! Ohhhhhh my gawsh!!! Tina this came out GREAT! I love this set (it's on my wishlist). I would be so inspired to be using this cutie daily!! This floral paper looks lie a real piece of fabric! This is so cute and a wonderful idea. I just recently started sewing too and bought the same machine LOL. I had this same thought and had this stamp in mind, but just don't own it. It is so amazing to see my vision show up like this!!! how cute and original! love the paper-pieced 'fabric' cuppie is sewing! have fun on your sewing adventures! How cute is this notebook!?? Such a fantastic idea! This is so colourful and FUN!!! What a fabulous sewing notebook!!! Lots of nice colors! Awesome job! Adorable! I love how you used the extra patterned paper for Cuppie's sewing project! Lovely notebook! I love that glitter border and your fabulous coloring! Oh I love this!!! FAbulous, fabulous job! Your little sewing cuppie is sooo cute...love the paper piecing and fun details you added to this adorable card!!!! Love all the little details! Sewing cuppie is just too cute and I'm sure you'll get a lot of use out of this notebook. Totally awesome!!! And perfect, too! It will definitely come in handy, and be a joy to look at! This note book is so cute. I love all the little sewing details.